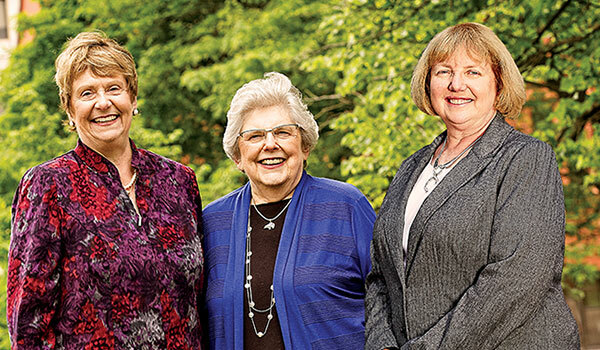 These three deans of the UWM College of Nursing created a “Legacy Gift Challenge” to encourage nursing faculty, staff, and alumni to include the college in their estate plans. Over the past several decades, Deans Emeritae Norma Lang and Sally Lundeen, along with current Dean Kim Litwack, have led the college through periods of remarkable growth and change. In 2017-18, their leadership spurred others to make plans to support nursing education, research, and community engagement well into the future. Their efforts resulted in 20 gifts totaling over $1 million. The challenge started with the deans making their own estate plans to benefit the college. Kim Litwack, named dean in 2017, created a gift plan to support unrestricted scholarships for nursing students. The gift from Sally Lundeen, dean from 2001 to 2016, will support the community-based nursing centers she championed broadly as dean. The gift from Norma Lang, who served as dean from 1980 to 1991 and retired in 2013 as dean emerita from the School of Nursing at the University of Pennsylvania, will support nursing faculty research as a strategic means to nurture and retain promising scholars early in their careers. Her gift will give special consideration to those whose research focuses on nursing informatics, an area she pioneered. 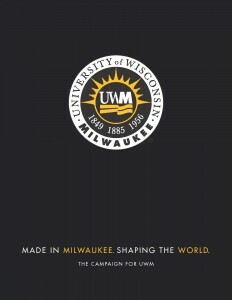 The deans’ gifts reflect the three priorities of UWM’s comprehensive fundraising effort, Made in Milwaukee, Shaping the World: The Campaign for UWM. Focused on raising support for students, research, and community engagement, the campaign has a goal of $200 million, the largest in UWM’s history. During the Legacy Gift Challenge, each dean agreed to increase the value of her estate gift incrementally as other donors shared their own estate gift commitments to the college. The response of faculty and alumni was impressive, with 17 new gifts recorded this academic year. For more information about the Legacy Gift Challenge, contact Nicole Blemberg at blembern@uwm.edu or 414-229-5617. Visit our Planned Giving page for questions about estate planning at UWM.